Neither of us were terribly interested in baseball. To me it’s a playoff sport, I love fall baseball but the teams on the field got knocked out of playoff contention long ago. Regardless, we scalped some really cheap tickets to the Cincinnati Reds and Colorado Rockies game. 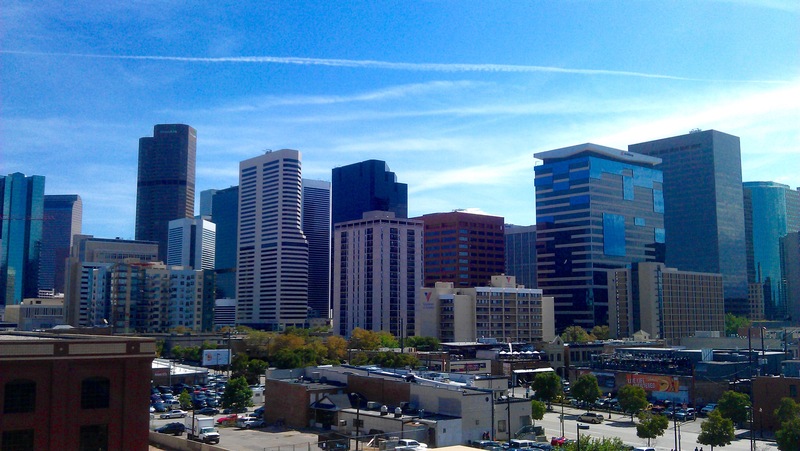 Weather wise it’s the perfect early September Denver day for taking a leisurely stroll down to LODO after eating brunch at Snooze on Park Avenue and Larimer Street. Our tickets were in the Rockpile, a general admission section high above center field, but we were more interested in exploring the stadium than watching the game. It didn’t take long to realize that Coors Field is a pretty nice ballpark. The Rockies are up two to nothing with two outs in the bottom of the sixth inning so there isn’t much more baseball left to watch anyway. We found an area on the upper level above the home plate entrance to the ballpark that was open air and looking southwest out at the downtown Denver city skyline. It’s quite a beautiful sight so I pull out my phone to take a picture and send it to my friend back home in Phoenix. Overlooking 20th and down Blake, we hear the organ playing the melody for the seventh inning stretch though it fades as people are starting to flood into halls of the upper concourse. We proceed to take a lap of the concourse and when we slice upstream through the river of people, surrounded by total strangers and one good friend, I realize that I’ve sampled the fruit of travel and that I now have the opportunity to strive for something more grand and sweet. “Miles away…” I type and send. “Where are they this time?” Tommy asks. “Lucky. Where did you go again?” I respond and place my phone back into my pocket. “Ya. When are they?” Tommy asks. During our walk, I hear those indicatively slow ascending and descending gentle wavelengths of cheers and disappointment from a crowd watching a baseball game. The way the pitching and fielding are going, this game sounds like it’s going to be over soon. We’ve come full circle and stand in the same place as before. I’m leaning forward with my forearms resting on the rail while clinching my hands together. Tommy is looking the opposite direction with the small of his back against the rail and his arms crossed. I notice Tommy is thinking about what I’ve just proposed. “I’m jealous but I’ll leave the country some day. I’m determined. Yes, clever girl, I’m in Denver with a buddy. We’re just hanging out up here on an extended weekend. Taking in a baseball game on a lazy Sunday afternoon right now.” Text sent. “Well I still need to get my passport. So any international travel plans are just dreams until then.” I answer. Placing my phone in my pocket, I turn around and deduce that the game has ended. The Rockies must have won as celebratory music is playing and people are flooding the concourse again. “We would have to get our passports.” I mention. While flowing along with the sea of people in these large, dim and sloping hallways, I check my phone one last time. “You’ll be the first to know.” I tell her. The Olympics will be well worth the trip. I visited Atlanta in 1996 when they held the Olympics and I can remember it being a trip around the world with so many nationalities gathered at one location. Enjoy the anticipation! haha, I should pay a bit more attention. Good set up then. I’m ashamed of my sports knowledge after my comment. I wasn’t even thinking when I read “London”.